APEC Water is a leading manufacturer of reverse osmosis systems and water filters in the United States. Their water filter systems remove up to 99 percent of contaminants found in well and tap water. Their reverse osmosis (RO) membrane is the best in the industry for removing contaminants. APEC supplies whole house and commercial reverse osmosis filters, car wash systems and shower and bath filters. This 6-stage RO filtration system boasts high-quality parts, with the full assembly in the USA. The long-lasting premium filters offer safe drinking water. They also work for a long time, so homeowners don’t have to worry about changing the filter often. This top-tier system delivers up to 75 gallons per day of clean, safe drinking and cooking water. Buyers can rest assured that their water is free of bacteria and viruses. The system also removes chemicals and organic contaminants. This under-sink unit has a remineralization stage (the 6th stage), which is a popular add-on for RO systems. It counters the bland taste of water purified by reverse osmosis. 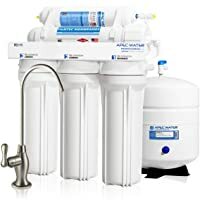 Anyone with basic DIY skills can set up this complete system in about an hour. The RO-90 Top Tier filter is another system from APEC with a large number of positive reviews. It produces up to 90 gallons per day. This is excellent news for buyers who use large amounts of filtered water. Now you can fill your aquariums and get clean water for cooking and drinking. The RO-90 has a 5-stage filtration process. It wastes an average of three gallons to produce one gallon of purified water. The APEC RO-90 removes sediment and unpleasant odor and taste, cloudiness, excess or harmful minerals, common chemicals, and volatile organic compounds. It removes total dissolved solids, bacteria, viruses, arsenic, lead, chlorine, fluoride, radium, chromium, and more. Similar to the ROES PH-75 with basic DIY skills can set up this complete system in about an hour. This is one of APEC’s budget choices. This reverse osmosis system uses a 5-step filtering process. It removes chlorine, fluoride, lead, copper, viruses, bacteria, and heavy metals. The filter is efficient, with a wastewater/pure water ratio of 3:1. The large capacity block filters on this system are long-lasting. They remove up to 99 percent of harmful water contaminants. The system comes with a lead-free designer faucet in brushed nickel. This RO system from APEC designed and assembled in the USA, therefore, it has to pass rigorous testing standards. Users thus have the guarantee of safe drinking water that’s good for their health. This system has optional upgrades such as an icemaker kit, a designer faucet, and a larger tank. The water from this fantastic product is 99 percent contaminant free. 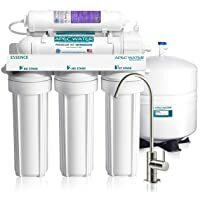 The filter removes chlorine, arsenic, fluoride, lead, bacteria, viruses, heavy metals, and more than one thousand contaminants. Save time, money, and hassle. Instead of expensive bottled water, get this ultra-safe filter for contaminant-free water. Buyers get lifetime support from APEC’s team of WQA-certified water specialists. The Essence ROES-UV75 under-counter RO unit has a large capacity. The block filters that remove up to 99 percent of dangerous water contaminants are also long-lasting. The UV kills 99.99 percent of parasites, bacteria, and viruses for added protection. It is effective on city water and on well water, and it removes a wide range of contaminants, including fluoride, chlorine, and lead. It also eliminates arsenic, chromium and more. APEC manufactures this system with high-quality food grade materials, pressure tested to ensure durability. The design guarantees easy installation and maintenance. The system is compatible with most industry standard size replacement filters. The super capacity filters on the APEC Ultimate RO-Hi system last twice as long as other brands. They also offer a higher rejection rate. This product is WQA Gold Seal certified to remove 99 percent of contaminants. The Dow Filmtec membrane provides a super-fast output at 90 gallons per day. Enjoy great tasting, fresh water right at home. The water is perfect for cooking, drinking, and making delicious tea, coffee, and ice. The refreshing, crisp taste is superior to that of bottled water. APEC’s team of certified water specialists offer lifetime support for this product. 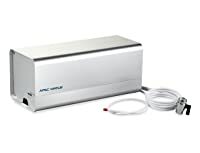 Apec’s Ultimate RO-Perm system is best for homes with low pressure. 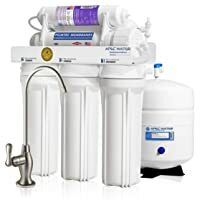 This top tier ultra-pure drinking water system contains super long-lasting US made filters. It produces 90 gallons per day and has a permeate pump to boost performance. The storage tank fills up 2-3 times faster than that of competing brands. This system increases delivery pressure at the faucet. 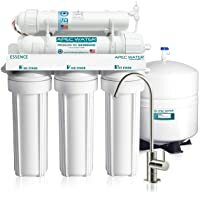 The APEC WFS-1000 is a 3-stage system that removes bad tastes and odors and chemicals from water. This is one of the most popular under sink filtration systems. The WFS-1000 system is easy to install and comes with all the necessary components. The durable filters last over 12 months and need fewer change-outs. 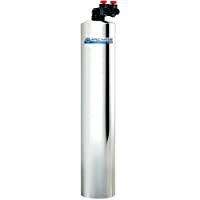 This system provides a continuous supply of fresh filtered water with excellent pressure. APEC manufactures its products from high-caliber materials to offer long-lasting, reliable performance. 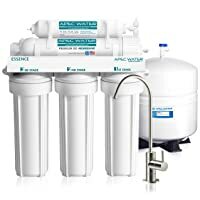 The APEC CS-2500 under sink filtration system removes chlorine, lead, chemicals, and heavy metals from your drinking water. It eliminates odors and bad tastes but ensures that essential minerals such as potassium and calcium remain in the water. It is bacteriostatic for the removal of heterotrophic bacteria. It comes with standard 3/8-inch lines that attach to the existing faucet stem and cold-water valve. Thus, you won’t need to drill any holes, and installation is trouble-free. If you’re in a temporary location, you can still enjoy reverse osmosis filtered water. The same goes for if the installation of an under-sink system is not practical or not allowed. 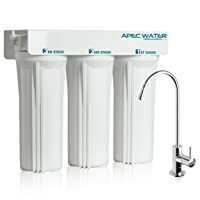 APEC advertises the RO-CTOP-C portable countertop water filter system as “installation free.” That’s because all you need to do to get it up and running is to attach it to a standard faucet in place of the aerator. This system produces 90 gallons of crisp, fresh tasting water per day. It’s perfect for RVs, condos, apartments, travelers, and students. 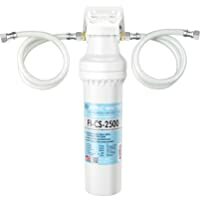 The APEC Alkaline Mineral portable countertop RO water filter is easy to install. It hooks up to most standard faucets. This 90 GPD compact system provides refreshing, great-tasting water. 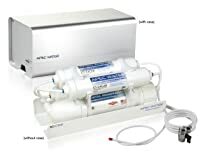 For people who love mineral water, this RO system adds calcium to enhance the taste. The mineral cartridge adds pure calcium carbonate to raise pH levels in the water. This is excellent news if you want alkaline water. 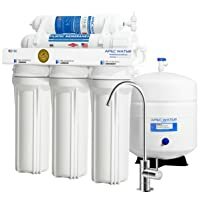 High-flow applications are no match for this Big Blue whole house carbon filter, with its unique design that meets all your large capacity water purification needs. The activated carbon filter cartridge removes bad tastes and odors. It also eliminates chlorine, and volatile organic compounds (VOCs). Now you can get clean, filtered water to every outlet in your home. This system is suitable for whole house filtration and light commercial use. You can also use it for industrial applications. Clean, iron-free water can be yours from every faucet with this whole house system. 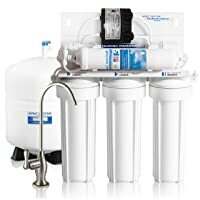 Chemicals, sediment, and iron are no match for the 3-stage Big Blue whole house water filter. The first stage sediment filter traps sand, dirt, silt, rust and scale particles down to 30 microns. The water then goes through the second stage iron filter, which uses high-purity manganese dioxide. This stage reduces iron and its staining effects. It also eliminates the metallic tasted in your water. The third stage carbon filter is a radial flow granular activated carbon cartridge. This cartridge absorbs insoluble ferric iron. This filter delivers clean, soft water to every faucet. You can use it for all your needs. It’s ideal for whole house, light commercial and industrial applications, and it has a fast flow rate. Clean water that is chlorine and sediment-free is now possible at every faucet. 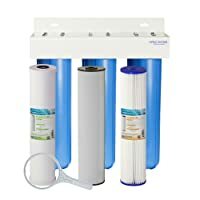 Chemicals, sediment, odors, and chlorine are no match for the Big Blue whole house water filter. The second stage absorbs odors, chlorine, bad taste, and organic compounds. This filter delivers safe, clean water to all your faucets. It’s ideal for whole house filtration, light commercial or industrial applications. 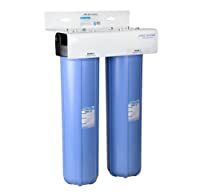 The FUTURA-15 Salt-Free Water Softener is a new advancement in filtration technology that conditions water without the use of corrosive chemicals or salt. No regeneration, backwashing, or electricity is necessary with this filter. It uses an innovative ceramic media that attracts and neutralizes hard water properties. Its durability is exceptional. Cleanup for windows, cars, and dishes just got better with the FUTURA-15 system. It conditions water without a slimy feeling and is perfect for water hardness concentrations under 25 grains per gallon. The system is 100 percent nontoxic to plants, and it is also environmentally friendly. It does not release any chemicals or salt waste into the water. It improves your cardiovascular system and reduces health risks. APEC provides detailed manuals and instructions for their products. Their tubing is also color-coded, which makes it easy to install these DIY units. The systems are slim so they can fit in most standard cabinets, even if there’s a garbage disposal unit. The company supplies original, top-quality replacement filters made for their systems. Most filters last between 2-3 years. APEC’s high-end brands can last even longer than that. APEC offers superior quality WQA Std 58 Gold Seal certified systems. Even better, you can buy these systems at affordable prices. The gold seal means that APEC meets strict public health standards. It also means that they have passed weeks of rigorous testing for material and parts safety. APEC also tests structural integrity and contaminant rejection performance. Now, this all-star brand is yours for the asking.